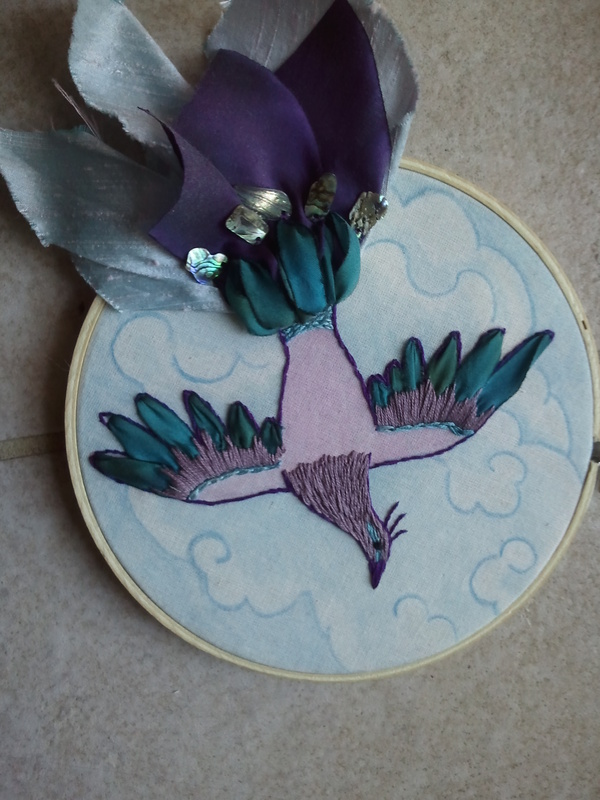 I’m about finished with the kingfisher, but before I show you the finished project, here are some other birds I’ve been playing around with. These guys are in a completely different style, based off a painted plate my parents got on a trip to Italy. I made this a while back, and there are some things I’d do differently now (mainly the sloppy stitching on the breast, oh well.) 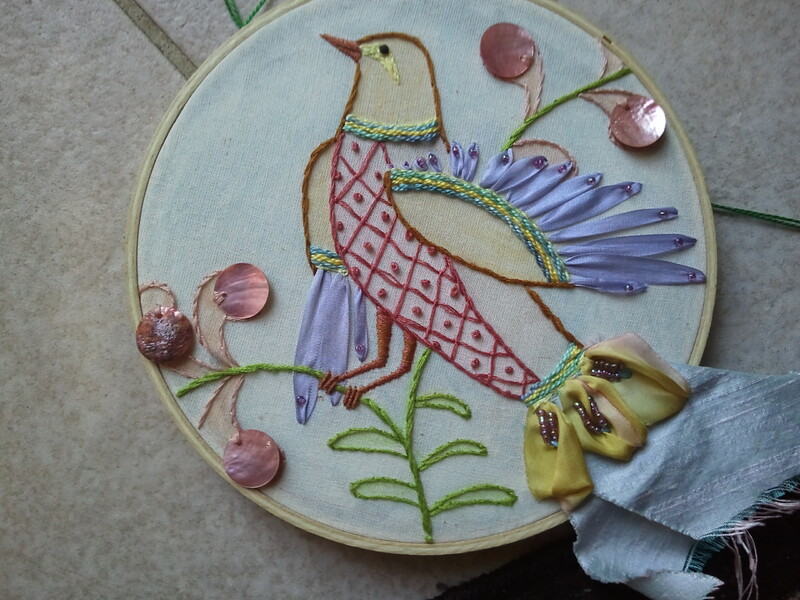 I wanted to play with two things–first, doing a drawing on fabric in crayon and ironing it to form a base for the stitches, and second, playing around with ribbons and beads. These birds are kind of blingtastic. The crayon background is perhaps most successful with this one. I almost hesitate to call this “ribbon embroidery” since it’s just straight stitches at its most fancy, but it was a lot of fun to do. I’m playing around with the idea of making some more of these for a child’s room. I like the bright colors and the use of crayons seems somehow appropriate, as does finishing them with simple wooden hoops. 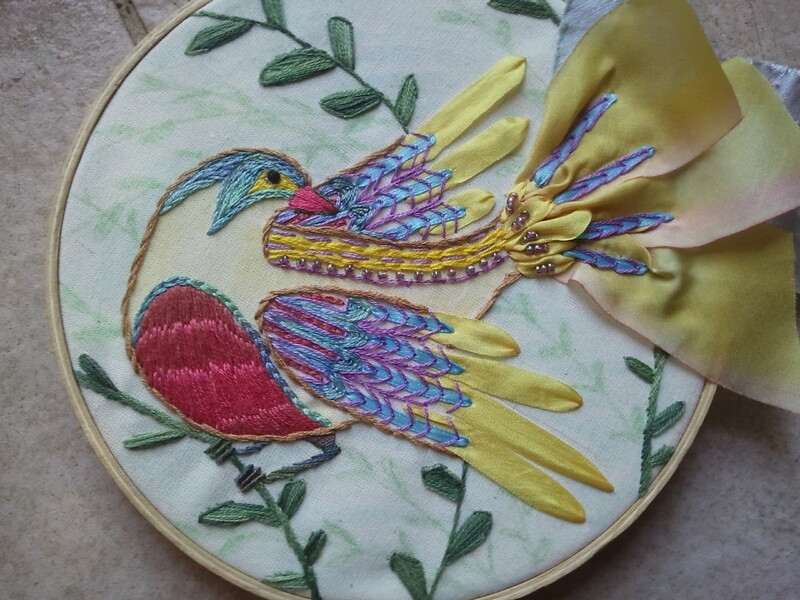 This entry was posted in Uncategorized and tagged birds, embroidery, finished work, ribbon embroidery, ribbon embroidery well kind of, surface embroidery by Rene. Bookmark the permalink. WOW! you are so talented, LOVE LOVE your birds!! Thanks so much for the kind words! And thank you for the comment about the stitching too. 🙂 I think the flaws stand out because I would do it differently now, but it’s nice to know that what jumps out at me doesn’t necessarily to someone else. I think those are gorgeous! Crayon can work so well in some cases. I used it on my elegant zombie pillow, when stitching just wasn’t possible, but something was needed. Thanks, Caine! It’s fun to play with. I think I’m going to experiment some more to see if I can get some deeper colors without it looking to scribbly. I’ll check out your pillow, too–don’t remember that one off the top of my head. .